The wind howls outside , moaning, screeching. Rain driving down like knives shearing leaves from the trees. The world outside is in turmoil and one would believe that Cailleach Bheur, Bone Mother is out walking. It is cold, dark, and very wild. Another panel needs to be created for GAIA . It is September 2008. A promise had been made. When the brush dipped into paint and then to fabric I had no idea of what was to appear. A shadowy face was revealed and constantly changed. Quite eerily layers dissolved and reworked became bone; a skull, leering, terrifying. Something that was quite alien to my usual methods and subjects. She insisted on being present. Scrubbed out, worked over many times She re-emerged; that death mask. Like so many, initially, my reaction to Her was one of fear and avoidance. No matter how I tried to alter Her the changes did not last. Till at last surrender. Surprisingly this aspect became a very comforting presence. Mythology and folk tales of Her are of dread and terror. She is depicted as an old woman often referred to as that old hag. She was regarded as ugly, cruel and evil; The Dark One – yet in essence She is The Wise One, The Crone, The Healer. An Ancient One whose bones creek in winter and rattle the eternal story of regeneration. Look into Her eyes. Do they appear bloodshot, crazed, piercing, cruel? Perhaps. Look deeper for there is love and sorrow; compassion and hope. Above all I found kindness. Her offering is a seed that is sprouting, a gift of life and renewal. She promises healing. All she asks is to surrender. Her task for us is to strip down to bare bones, to let all the old constricting habits and prejudices, fears and restrictions go. Sink down into her, Knowing. Trust. Surrender. Die. In total release live. The back of this quilt is equally important in this piece. It is has significant symbolism connected to the Crone as an aspect of the Great Mother. This backing fabric is covered in snakes. A strip of the fabric is also incorporated at the base of the front figure. The snakes, or serpents, are done in a primitive art style. This fabric was chosen to represent connection to ancestors, the land and as a powerful and universal symbol related to life and death, creation and renewal. In this instance it is also appropriate for its healing ( think caduceus) and chthonic attributes that were the hallmarks of the Crone. 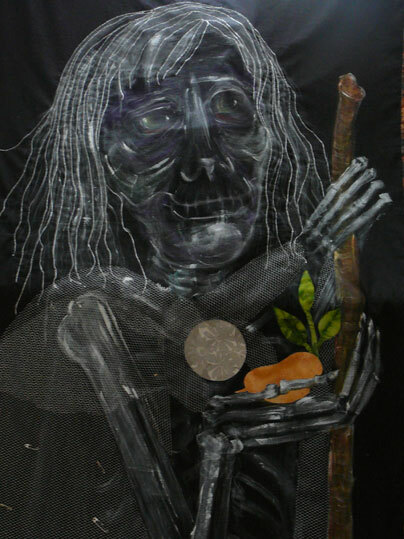 Bone Mother was painted and then overlaid with a cloak of silver mesh which features a disc of three flowers representing the Three Stages, the cycle of life. Her hair, windblown and of the wind, formed from strands of silver thread that are couched to hold in place. Her Staff of Life is painted and like the seed hand appliqued in place. The backgound is quilted with whirling lines to suggest swirling energy of a wild, windy day. Yet the Bone Mother is still and at peace. Waiting.